When I think about how much trash we generate in our search for convenient packaging, I see a lot of trash going out our door that doesn’t have to. What are we paying for with all the convenience of little zipper plastic bags in the kids’ lunches? For this TINSTAAFL Tuesday, I’m doing something a little different. I’m going to share with you one of my recent finds that might help save our landfills from a few thousand plastic baggies and keep the world from looking like the trash-filled, desolate place shown in the movie Wall-e.
I’m going to use machine-washable bags that I found online. Ziploc now makes their baggies recyclable. You can then them in with the plastic grocery bags. Cool. But what if the bags are disgusting? Who takes time to clean those baggies out before throwing them in the plastic bag recycle bin? If you’re like me, you probably just throw them in the trash rather than fool with the mess. Not very Earth friendly. Then, I found these items on zulilly.com. I love this site for discounted shopping, especially for my clothes-horse 7 year old. There are several sites (Haute Look is another one I browse) that offer sample sale or discounted prices for all kinds of items. ReUsies are nylon-lined, cotton pouches that can be washed in the washing machine or the dishwasher. The website has videos. I bought several sets from Zulilly (I hate to pay full price for an experiment). 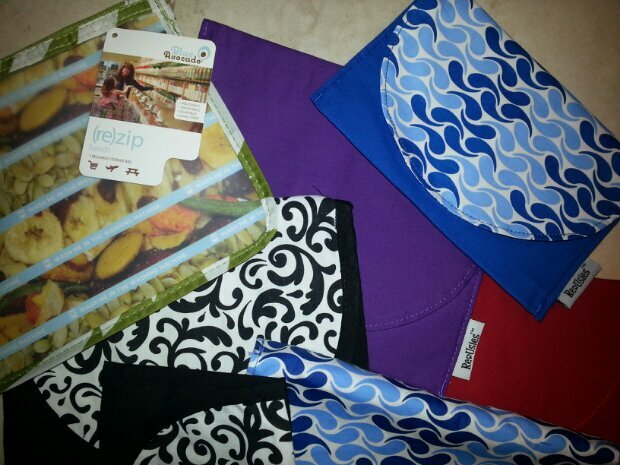 I also bought a set of six zippered bags from Blue Avacado (I like their reusable shopping bag assortment, too). These are also washable in the washing machine. For both kinds, you have to turn them inside out before washing. I mean really turn them inside out or else food that’s stuck in the corner may not wash out. Ewww. I’m going to give it a try for awhile to see if I can keep many little plastic bags out of the landfill. Do you do things to decrease your eco footprint? What do you think of reusable bags? What else is on your mind?